Prime Minister, the Most Hon. Dr. Hubert Minnis and delegation, including Minister of Tourism & Aviation the Hon. 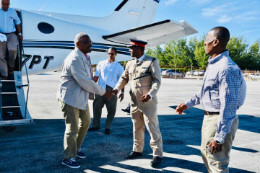 Dionisio D'Aguilar, arrived in Rock Sound, Eleuthera, this morning -- met by the Island Administrator and police -- before setting off for Half Moon Cay to tour Holland America Cruise Line's MS Nieuw Amsterdam.